PROTECTING the rights of EU nationals and ensuring continued progress in equalities legislation in the UK post-Brexit were top of the agenda for unionists at the TUC Women's Conference 2017. But for those self-employed, freelance, contract and precarious workers at the event in London on 8-10 March, there was welcome recognition of the increasing pressures being faced. The NUJ's delegation at the Women's TUC Conference. Left to right: Magda Ibrahim; Cath Saunt; Anita Halpin (former NUJ president); Ann Galpin and Maureen Paton. Raising her concerns about a lack of Government support for women's work issues, the Shadow Secretary of State for Women and Equalities Sarah Champion MP highlighted self-employment and zero hours contracts as a major challenge. "We know the labour market is becoming increasingly precarious," she told the 300 delegates from 31 unions. "There are now nearly one million people on zero hours contracts and we cannot fool ourselves into thinking that women who are self-employed are having their rights protected." The issue of self-employment and women's rights was a theme that ran through the conference, with motions highlighting the lack of maternity leave provision, or rights enjoyed by employed workers, such as paid time off to attend antenatal appointments. Changes to the state pension age and the effect on women workers was also a topic for debate, as the demands of childcare and other caring responsibilities were likely to have had an impact on pension-earning ability. 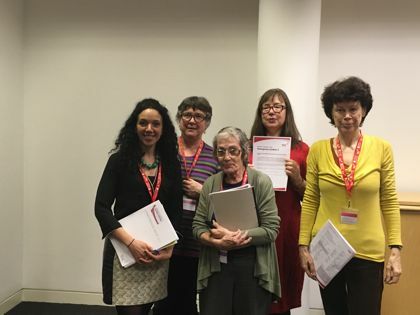 The four-strong NUJ delegation - made up of London Freelance Branch members Maureen Paton and Magda Ibrahim, along with Disabled Members Council chair Ann Galpin and NUJ Norfolk's Cath Saunt - tabled a motion to tackle cyber abuse and its toll on women journalists. Cath Saunt told conference: "Women journalists and bloggers, generally strong women's voices online, are especially prone to the vilest of words and images. One survey in 2014 showed female journalists received three times as much abuse via Twitter as their male counterparts. Yet many of us feel we have no alternative but to use Twitter and other social media platforms as part of our work." The motion passed unanimously, calling on the TUC to carry out its own survey of online abuse and its impact on work performance, as well as to work with employers, police and social media platforms to encourage victims to report abuse, and to press for parliamentary ratification of the Council of Europe's Istanbul Convention. Meanwhile, TUC general secretary Frances O'Grady didn't mince her words when addressing delegates: "We face the toughest political and economic climate I can remember for a very long time, with profound uncertainty over Brexit and the alarming spread of right-wing nationalism." And of the three priorities she outlined - ensuring working people don't pay the price of Brexit, ending violence against women, and securing a new deal for women workers - there was a desire to see a paradigm shift, brought about by nurturing the next generation of trade unionists. "We want to secure a new deal for women workers, delivering fairness and positive flexibility for all, and giving every woman the chance to fulfil her potential," she said. "One in 10 are on zero hours, casual contracts, lower paid, doing insecure work. We need strong unions winning for our workers."